Video surveillance can be vulnerable to interruptions cause by network drop, hardware failure and human error. The consequences can be disastrous and costly. Instek Digital™ therefore has developed a high level of risk mitigation solution - i2DP (Instek Digital Disaster Prevention). 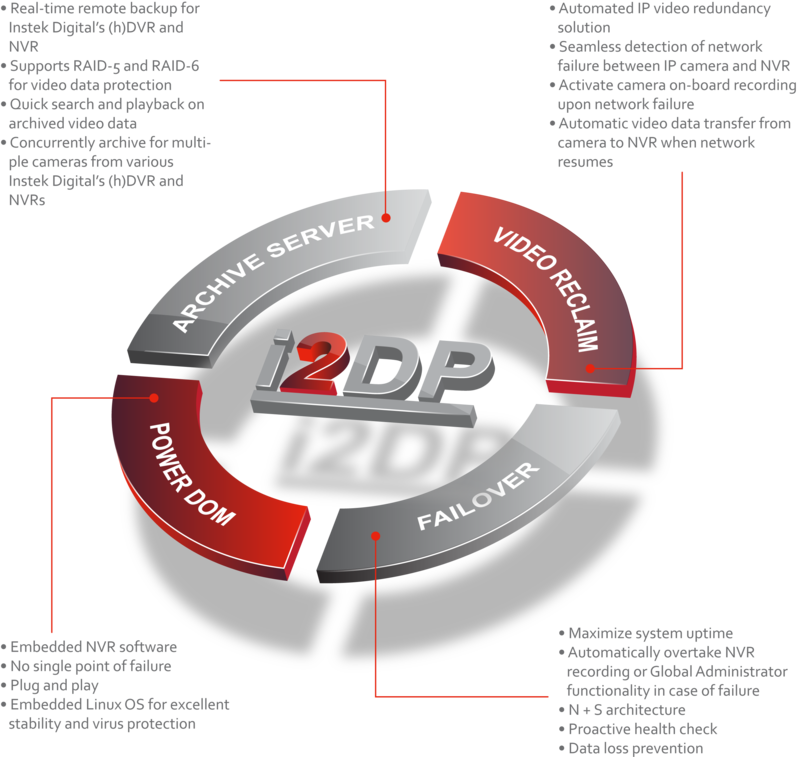 i2DP is an innovative solution for disaster prevention that offers signification benefits for reliable video surveillance systems. Video surveillance systems are expected to be reliable - but regardless of how reliable it may be - there will always be a number of inherent risks. These risks can have serious repercussions and are unavoidable even in the most reliable video surveillance systems. This is why it is essential to have a sound backup solution. Instek Digital™ is aware of the importance of a fail-safe video surveillance system and developed i2DP. Instek Digital Disaster Prevention helps to reduce risk and minimize downtime in the event of a disaster. This solution includes the following four elements: Power DOM, Archive Server, Video Reclaim and Failover. Instek Digital’s Archive Server is designed to be an additional option in protecting vital video data that needs to be indefinite periods - allowing remote video data archival of multiple camera sources and any number of video recorders. Instek Digital’s Failover Archive Server is a powerful solution that acts as a safe-guard for Instek Digital's Archive Servers. For organizations maintaining a surveillance system - downtime means loss of business, wasted resources, exposed liability and security threats. With an Archive Server - users are ensured with a safe and solid solution preventing critical data loss. Instek Digital’s Video Reclaim provides an end-to-end solution from detection to playback with no need to download using FTP. The integration between camera and recorder has created the next generation of fault tolerance with no need for additional investment in costly additional servers saving money and increasing peace of mind. In order to create a reliable video recorder - Instek Digital’s Power DOM is a plug-and-play solution which allows users to create a video recorder from any ordinary computer. Instek Digital Power DOM contains Instek Digital’s enterprise NVR software with customized Linux operating system. Because the software is pre-installed on Instek Digital Power DOM - there is no single point of failure due to HDD malfunction. In additional Instek Digital Power DOM provides the user with a most stable and reliable surveillance platform - due to the customized Linux operating system. It is a fact that Linux is less virus sensitive than other operating systems and there for minimizes the risk of virus attacks. To ensure that video recorders never stop recording - Instek Digital’s Failover NVR has been designed to eliminate this risk. Instek Digital's Failover NVR will automatically take over the NVR’s functionality in case of any malfunction. The redundant NVR will continuesly detect whether the NVR is still functional and in case the feedback is negative - Instek Digital's Failover NVR will immediately take over the streaming and recording without warning or human intervention. Instek Digital's Failover NVR is based on the N+S concept - which mean that it can detect multiple NVR at the same time. This makes it a cost-effective redundant solutions and protects all recorders in mission-critical applications.